Earth Science Information Partners (ESIP) is proud to announce the recipients of several awards, including the 2017 Martha Maiden Lifetime Achievement Award, President’s Award, the Catalyst Award, and the ESIP of the Year Award. These awards recognize community members that have made outstanding contributions to ESIP and the broader Earth science data and informatics community. Letters of support noted that Cyndy is an unwavering champion of data science and information management. She has been active in development and advancement of best practices and novel technologies that not only benefit the oceanographic community, but are also extensible to other domains and communities. She has played a pivotal role in the evolution and success of the Biological and Chemical Data Management Office (BCO-DMO). She continues to educate and collaborate to advance the practice data management and curation, advocating for open science, and promoting data publication and citation. Her efforts to adopt standards and utilize controlled vocabularies within BCO-DMO have lead to collaborations in semantics and Linked Open Data that have accelerated oceanographic data management and interoperability. 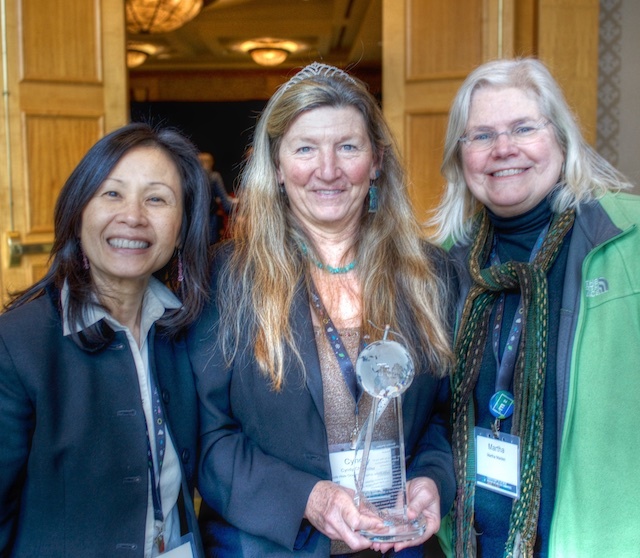 The award was established in 2009 in honor of Martha E. Maiden, then NASA Program Executive for Earth Data Systems, for her leadership, dedication and tireless efforts to nurture the ESIP Federation into a vibrant and mature organization. ESIP feels that is vital to recognize members for their significant and primarily voluntary contributions to the community in order to further interoperability. ESIP is a consortium of Earth science data and technology professionals spanning government (NASA, NOAA, EPA, USGS, NSF), academia and the private sectors (both commercial and nonprofit). The organization is dedicated to transforming research data and information into useful and usable data and information products for decision makers, policy makers and the public. The Foundation for Earth Science provides administrative and staff support to the ESIP Federation.